Two hundred ASCE members fanned out across Capitol Hill this month for the annual Legislative Fly-In with a strong message: Our nation’s infrastructure problems are solvable if we have strong leadership in Congress. The message was a one-two punch – both highlighting the nation’s need to eliminate the backlog of infrastructure deficiencies, modernize our roads, bridges, water systems, and energy grid, plus reminding Congress that to promote commerce and protect public safety, welfare, and the environment infrastructure investment is a priority issue. ASCE’s Legislative Fly-In, held March 19-20 in Washington, D.C., provided a unique opportunity for Society members to talk with their representatives in the House and Senate or their staffs about the need to invest in infrastructure. This year, members had the benefit of sharing the newly released grades in ASCE’s 2013 Report Card for America’s Infrastructure, released the Tuesday the Fly-In got under way. 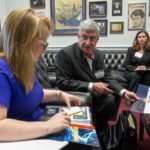 Fly-In attendees faced a 113th Congress comprised of many members who wish to limit government spending and reduce the national debt, placing heightened scrutiny on all federal expenditures, including those to repair or replace the nation’s infrastructure. One of those members of Congress is an ASCE member, who spoke to attendees at the Fly-In breakfast about the value of civil engineers going to Capitol Hill in person to provide technical perspective to members of Congress who are not engineers themselves. Rep. David B. McKinley (R-WV), P.E., F.ASCE. “We need people with training to be able to better articulate the position on these matters. So what civil engineers should be doing is [talking to their congressional representatives about] changing the priority in our spending so that we are addressing some of these issues in a better way. Armed with the 2013 Report Card, Society members embarked to Capitol Hill to share the results with their home district’s House representative, which many downloaded on their tablets. Rep. Frederica S. Wilson [D-FL], who met with Steven Lubinski, P.E., M.ASCE, agreed. “Every day I am on the floor [of the House] talking about the importance of rebuilding the infrastructure of our nation,” says Wilson. “Hopefully before the end of this session, somebody will listen. “I hope to use this Report Card to our advantage to make sure we let our [House] colleagues know how we are rolling the dice and playing games with our nation’s infrastructure,” Wilson said. While sharing the Report Card, ASCE members also strongly urged their representatives to pass a new Water Resources Development Act in this session. Traditionally reauthorized every two years, the last WRDA was passed in 2007. The Report Card gave dams a D, inland waterways a D-, levees a D-, and ports a C, and ASCE’s Failure to Act report on the nation’s marine ports and inland waterways stated that without a new WRDA, it threatens one million U.S. jobs and $270 billion in exports by 2020. The WRDA renewal would create a National Levee Safety Program, reauthorize the National Dam Safety Program, increase spending for the Inland Waterways Trust Fund, and restore the Harbor Maintenance Trust Fund. “Infrastructure is what drives the economy,” said Rep. Rob W. Bishop [R-UT], who met with Shaun Dustin, Ph.D., P.E., M.ASCE. “So, if you don’t have a robust, effective infrastructure, you don’t have an effective growth rate in the economy. A third issue ASCE members addressed with representatives was to find a long-term federal funding solution for the nation’s surface transportation systems, as the next reauthorization comes up again next year after being renewed only last year. Budgeting for the Highway Trust Fund, which allocated $15 billion in 2012, has not been adjusted since 1993, and while transportation demands have grown, soon the Trust Fund will be depleted. The ASCE members who took part in this year’s Legislative Fly-In considered it such a positive, worthwhile experience that they intend to return to D.C. in future years. Cesare “Chase” DeRose, Sr., M.ASCE, immediate past president of ASCE’s Metropolitan Section, said the staffs of Sens. Kristen Gillibrand [D-NY] and Charles Schumer [D-NY] each loved the Report Card app and found the information very useful. 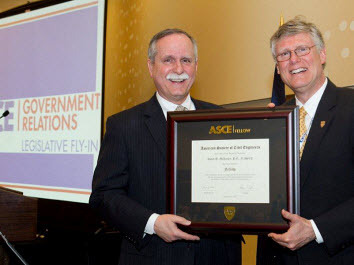 ASCE has held its spring Legislative Fly-In in Washington, D.C., for the past 14 years. Details on how Society members can participate in 2014 will be available later this year.